At Frontier, many of our staff remember life-changing experiences from their times at camp. These memories have simmered over the years and become richer as we witness more and more lives changed by Union Gospel Mission sending children in need to camps. It’s been on our hearts to help make a bigger impact for camps for years and, as you’ll read in this case study, we think we’ve done just that. Working together with UGM’s annual giving team, we crafted a direct mail package that was beautiful and heart-warming, packed full of fundraising excellence. Camp direct mail was already familiar to UGM and their donors, so our team’s leading mandate was to optimize. Our primary goal was to increase net revenue, with a secondary goal of improving the consistency of UGM’s communication across mediums (such as the Gratitude newsletter and digital materials). Here’s a visual of that fun and engaging campaign. The ask strategy around camp and the generous matching offer remained the same but to increase effectiveness, we honed the detail. 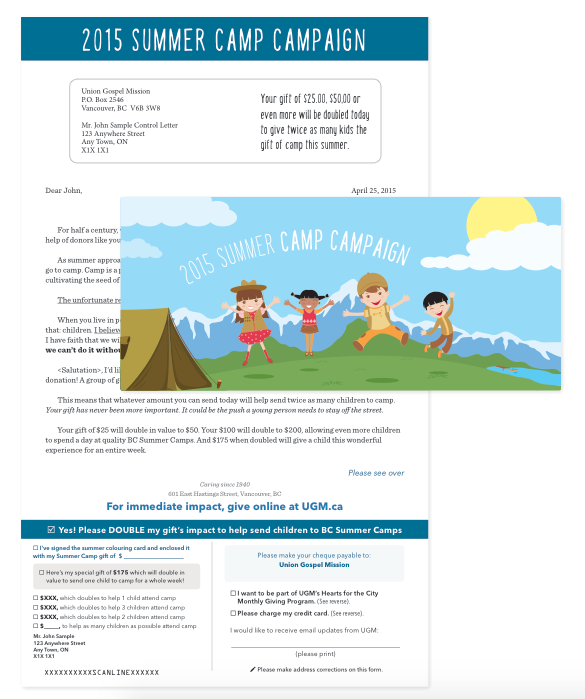 We significantly tweaked the reply form, adjusted the cover to reflect the actual demographics of the kids UGM sends to camp and tailored the copy to UGM and their donors. Finally, this was the first time UGM had a truly integrated multi-channel camp campaign. It was the best year on record. The quantity mailed was nearly 6,000 less than the previous year while revenue went up 19.4%. That’s up by nearly $32,000! What drove this change? Both average gift and response rate improved dramatically. The average gift increased 22% and response rate increased over 19%. Among camp appeals from 2010-2015, this ranks as the best overall campaign, with the highest response rate and largest average gift. But, our goal wasn’t just revenue. It was net revenue. Working more efficiently, the cost per thousand (CPM) for this appeal decreased 27%, a drop of $405 per thousand. That’s a savings of over $10,000. The net difference: over $45,000 more net revenue to send to impact lives than either 2013 or 2014. Our belief is that content is king. Your fundraising writing is by far the most important revenue driver. Using better data segmentation generally leads to more tailored content, while asking donors for the right amount and using appropriate language with them. Visually, we believe you should be the best you you can be for a given medium. Don’t engage in a race to the bottom. Drive value to your donors and dignity to the people you serve. The result is a winning combination. Sign up to receive news and insights from our team of fundraising experts! We respect your privacy, and won't send you nonsense.